Perfect for a small live-performance mixer, as well as home-based recording setup, the X1204USB/1204USB provides four mono channels with premium XENYX mic preamps, neo-classic 3-band British-style EQ and two stereo input channels. Far from being a ""bare-bones"" mixer, all mono channels feature our ""one-knob"" studio-grade compressor and two Aux Sends (one each pre- and post-fader). Two stereo Aux Returns are included for use with external FX modules. 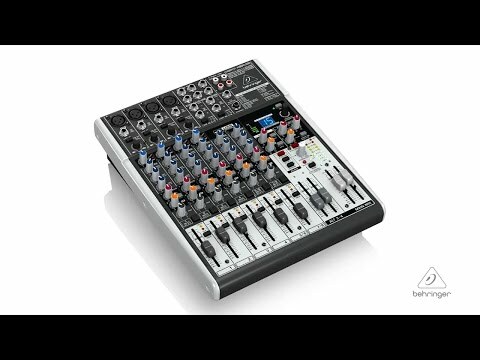 The built-in USB audio interface provides bi-directional transfer of signals between the mixer and computer. Ask professional sound engineers what their favorite piece of external processing gear is and the majority response will be virtually unanimous - dynamic compression. What is compression? We're glad you asked. Compression essentially limits the dynamic range of a signal, lowering the level of loud sounds and turning up softer sounds, to achieve sonic balance. But applying compression is a delicate art that many novice, and even intermediate, sound techs have great difficulty mastering. Our ""one-knob"" compression is available on all mono channels and is easy to operate, even for entry-level users. With this one knob, you can easily dial in the perfect amount of compression for instruments and vocals, creating powerful mixes with punch and clarity. This is indeed a rare feature for products in this class - but standard on all XENYX USB mixers.